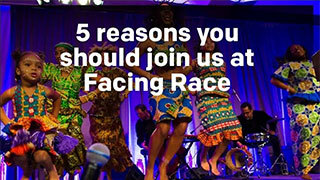 Attending Facing Race is an investment in racial justice movement building, professional development, and networking. It can also be beneficial to your organization. We’ve put together a set of support materials that you can use to convince your boss to fund your way to attend Facing Race this year. Don’t know how to ask for this kind of expense? Download our Letter to Your Employer. Need something to get them excited? Share the video. Want evidence of how awesome past Facing Race conferences were? Check out the Testimonials. See our full list of Resources.